The Tea Kettle by Warwick Gobble. Published in Green Willow and Other Japanese Folk Tales by Grace James, (1910). Read Japanese fairy tales by Yei Theodora Ozaki, and from the collections of Grace James and Matilda Chaplin Ayrton. Jump to full list of Japanese tales. About: Japanese folklore has remained a topic of interest for people across the world. Many stories that originated from Japan have inspired horror movies, graphic novels, anime, manga, and books, often because the stories’ characters make a lasting impression. An interest in Japanese culture and enthusiasm for sharing their traditions with other countries led to the publication of several books in the earlier 20th century, including Green Willow and Other Japanese Fairy Tales by Grace James and Child-Life in Japan by Matilda Chaplin Ayrton. Both were authored by women who weren’t native citizens of Japan, but had come to the country and fell in love with the culture. Author William Elliot Griffis wrote Japanese Fairy World, a collection of fairy tales and folk tales arriving in Japan in 1870 to reach English; the book was also published as The Fire-fly’s Lovers and Other Fairy Tales of Old Japan. The culture wasn’t without its own authors, however, as author Yei Theodora Ozaki, was of Japanese heritage. She translated Japanese texts, and added elements of the local area to bring the stories alive for readers. Much of the folklore and fairy tales of Japan are influenced and inspired by their religious beliefs, Shinto and Buddhism; however, the Japanese folklore canon also takes some of its influences from other countries’ literature, such as the stories of ancient India. 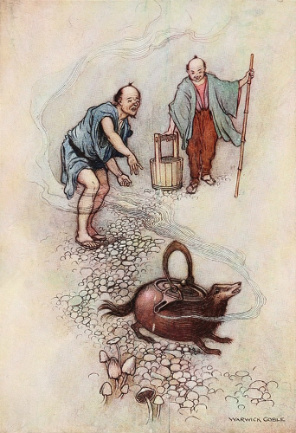 The characteristics of the folk tales are varied, but like The Grimm Brothers and stories of other famous storytellers, the folk tales from Japan feature themes like kindness, magic, and greed. Japanese folklore also include supernatural stories featuring creatures, spirits and monsters, many of which have characteristics of nature. 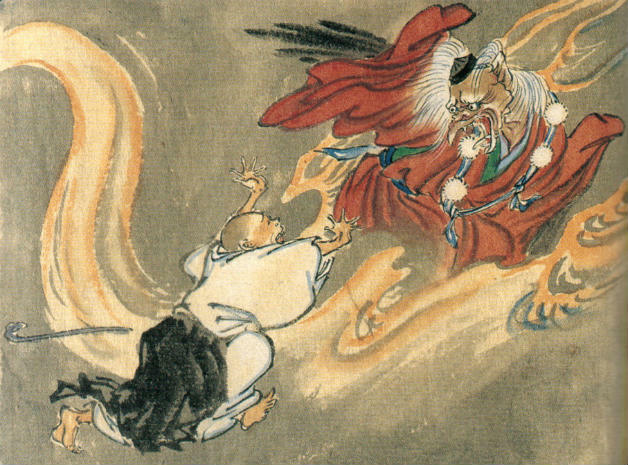 Similar to the folklore of Germany and France, Japanese folk tales began in the oral tradition and were eventually penned down for posterity. The oldest known chronicle from Japan is the Kojiki. Many tales originate from this collection of myths, which was published around 711 A.D. One popular form of storytelling of myth and folklore in Japan was known as Kamishibai, or “paper drama.” Kamishibai became particular popular in the 1920’s through the 1950’s, though it existed much earlier. The storytelling format would use picture scrolls or illustrated boards to tell a moral lesson in front of the townspeople of a local village; often the storyteller would return for a new installment of the story.